bought this helm at a garage sale for $45. I *think it is* Islamic basted on my weak research? 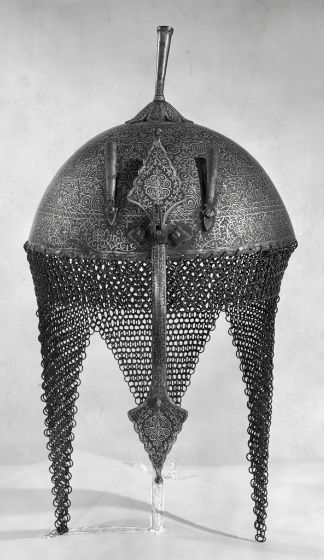 I would love to know anything anyone can share with me about what type of Helm it is and where it might have come from? I am not even sure if it is real or a repo? I hope this link works...it should this time. Its trying quite hard to be an Persian/Indian helmet. The style has a long life and a wide range so its not easy to pin down what they were copying. Its a made for the tourist industy but its not a bad effort. Good price for it. If you replaced the mail with some of Iceflacons riveted stuff it would improve.